A bank account with no minimum balance! Gain points whenever you like a post/ comment on Kotak Jifi facebook page, these points can be redeemed for online shopping ! World's first socially powered bank account ! So, these are the things that excited me when i read about Kotak Jifi bank account. Does this excite you as well? Then, i would reveal you few more features of this Kotak Jifi to make banking easy and fun :) Here is their home page which has a video to explain all the features quick. Zero minimum balance: You can create a non-interest account with zero minimum balance without any problem of tracking monthly balances. If your balance is more than 25k, you can earn interest on spare cash by automatically creating a term deposit. Social Banking: Track account details and transaction history, order a cheque simply from your mobile twitter account. Don't worry much about security, all details are saved in secured location and bank will send direct messages only. Are you a Facebook fan? 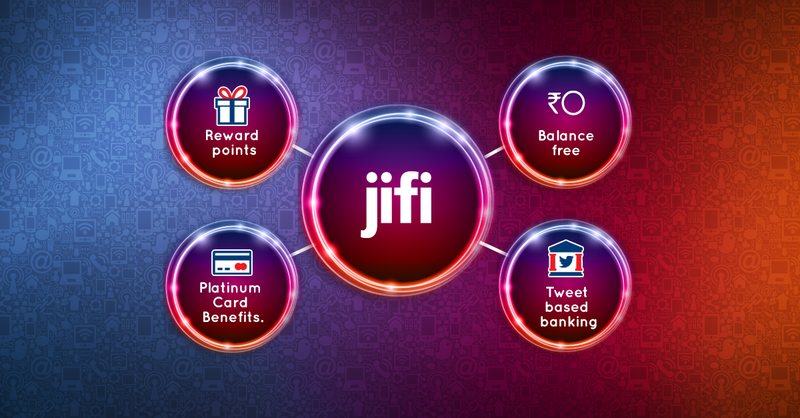 Earn points by liking or commenting on Kotak Jifi fb page or by referring a friend! These points are also transferable to your friends in need, and are redeemable for online shopping.. Isn't that cool? Signup Benefits: You will receive platinum subscription free for one year, can earn reward points for every online transaction above Rs.500 and 250 transaction points for each successful referral. Platinum subscription will enable you to use 'Kotak Money Watch' app, which will allow you to track your expenses at ease. Last, but not the least. Own a platinum chip based debit card on creating a new account. This post is written for indiblogger contest from Kotak Jify.